Devolved powers and EU withdrawal: Scotching the worst impacts of Brexit? Alan S. Reid, Senior Lecturer in Law, Sheffield Hallam University. The author welcomes comments on the blog at a.s.reid@shu.ac.uk. The modern concept of Devolution in the United Kingdom was devised, created and implemented in the general context and expectation of continued UK membership of the European Union. Scotland, Wales and Northern Ireland were all granted various levels of legislative and executive autonomy under a set of constitutional statutes of the UK Parliament (Scotland Act 1998(SA 1998), Government of Wales Act 1998 (GOWA 1998)(now the Government of Wales Act 2006 (GOWA 2006)) and Northern Ireland Act 1998 (NIA 1998)). These laws created a certain level of asymmetry in the scope and range of powers exercisable by the nations of the United Kingdom, however they all shared one common feature – devolved legislative and executive powers could only be exercised in a way that is not incompatible with the UK’s international obligations, particularly as regards the law of the European Union (Sections 29(2)(d) and 57(2) SA1998, Sections 58A and 108A(2)(e) GOWA 2006 and Sections 6(2)(d) and 24(1)(b) NIA 1998). Scotland’s devolution arrangements were always predicated upon a reserved model of devolution. Such a system provides that the Scottish Parliament is free to legislate on any residual matter, other than those matters that are explicitly retained by the UK Parliament. The matters that are explicitly retained by the UK are set out in section 29(2)of the 1998 Act. This provides that the Scottish Parliament cannot pass laws that apply extraterritorially, relate to reserved matters, attempt to change the terms of certain Acts of the UK Parliament (including the European Communities Act 1972), are incompatible with the European Convention of Human Rights or EU law or are an attempt to remove the Lord Advocate as the head of criminal prosecutions and the investigation of deaths. Notwithstanding the relative clarity of these terms, it has been judicially noted that there is of course some inevitable degree of overlap between the concepts (Martin v HM Advocate 2010 SLT 412, Lord Hope of Craighead at para 11 and Imperial Tobacco Ltd, Petitioner  CSOH 134). Thus, the system of devolution itself sets out a detailed process for determining whether a proposed Scottish law is within or outwith the legislative competence of the Scottish Parliament. More generally, the notion of devolution presupposes that the UK Parliament, as the only sovereign Parliament for the whole of the UK, is competent to legislate in any matter, devolved or reserved (Section 28(7)SA 1998). The Devolution settlement for Scotland and Wales, at inception, was always subject to the, admittedly theoretical, possibility that it could be simply reversed by a subsequent Act of the UK Parliament. However, both the Scotland Act 2016 and Wales Act 2017 provide for a more permanent arrangement, whereby the Scottish Parliament, Scottish Government, Welsh Assembly and Welsh Government are now treated as permanent features of the constitutional landscape of the United Kingdom (Section 63A SA 1998). This strengthening of the centrality of devolution to the fundamental tenets of the UK constitution also resulted in significant changes to the interplay between the Scottish Parliament and the UK Parliament. The Scotland Act 2016 now provides that the Sewel Convention, the constitutional convention that the UK Parliament will not normally legislate for Scotland in devolved matters without the consent of the Scottish Parliament, is now statutorily recognised (see Section 28(8) SA 1998). In the two decades of Scottish devolution, hundreds of Sewel conventions have been granted by the Scottish Parliament. The slim UK vote to leave the European Union on 23rd June 2016, poses significant issues and implications for Scottish devolution. The Scottish population overwhelmingly voted to remain in the EU (62%), however the UK Government is committed to leaving the EU on terms that mean the UK no longer accepts the jurisdiction of the ECJ, leaves the EU Single Market and the EU Customs Union and ends payments to the EU budget. The Scottish Government was therefore placed in an impossible position – it had to respect and defend the democratic will of the Scottish people to stay in the EU and its economic and legal structures, within the confines of the overall desire of the entire UK to leave the EU. The Scottish Government, from the immediate aftermath of the EU Referendum, was committed to engaging with the UK Government in reaching an acceptable compromise on the detailed terms of the UK’s exit from the European Union. However, it later became clear that the terms of the UK’s proposed Great Repeal Bill, and thereafter the EU Withdrawal Bill, were unacceptable to the Scottish Government. As a consequence, the Scottish Government intimated that it was likely the Scottish Parliament would be minded to refuse a Legislative Consent Motion (LCM) authorising the UK Parliament to enact legislation providing for the UK’s exit from the EU. Such a refusal would have limited practical legal effect, since the UK Parliament has unlimited power to legislate and in particular, the Scottish Government has no power to enforce any refusal of an LCM against the UK Parliament (Miller v S. of S. for Exiting the EU  UKSC 5], discussed here). Nevertheless, the refusal would have significant political effect. The Scottish Parliament refused to grant the LCM and the Scottish Government then pressed ahead with plans to create its own withdrawal legislation, in order to avoid a legal vacuum in the devolved statute book after the UK’s exit from the EU. The Scottish Government put forward its alternative legislative proposal, the UK Withdrawal from the European Union (Legal Continuity) Bill 2018, on the 27th of February 2018. It was presented as emergency legislation before the Scottish Parliament and as such, the UK Government was not notified of the proposal, as is the normal convention. As the law currently stands, Acts of the Scottish Parliament, as laws of a devolved legislature, do not enjoy an automatic presumption of legality, in contradistinction to the position of Acts of the UK Parliament (Imperial Tobacco Ltd v Lord Advocate 2013 SC (UKSC) 153 as per Lord Hope of Craighead). As such, legislative proposals of the Scottish Parliament are vulnerable to being attacked as being outwith the competence of the Scottish Parliament under two main lines of attack. Firstly, Bills of the Scottish Parliament can be attacked as being effectively unconstitutional during the four week gestation period of a bill between its approval in the Scottish Parliament and being given Royal Assent (Section 32SA 1998). The Advocate General for Scotland, the Lord Advocate or the Attorney General are entitled to challenge the legality of a Bill of the Scottish Parliament before the Supreme Court (Section 33SA 1998). Secondly, actual Acts of the Scottish Parliament are similarly susceptible to attack as being outwith the legislative competence of the Scottish Parliament before the Supreme Court (Section 29 SA 1998; AXA v Lord Advocate  UKSC 46). The UK Withdrawal from the European Union (Legal Continuity) Bill 2018 was criticised by no less a figure than the Presiding Officer of the Scottish Parliament itself. The Bill attempts to remove the limitation on legislative power set out in section 29 of the Scotland Act 1998 as regards EU law. The Bill also purports to bring EU law into the devolved statute book by creating Retained (Devolved) EU law and gives the Scottish Minsters powers to amend such law where this is necessary to make the law coherent and consistent. The Bill also attempts to require that UK Ministers do not change certain aspects of Retained EU law without the consent of the Scottish Ministers. When the UK leaves the EU, currently scheduled as the 29th of March 2019 under the UK Parliament’s EU (Withdrawal) Act 2018 (Section 20), the provisions of the Scotland Act 1998 limiting the power of the Scottish Parliament and Government to make law and perform executive functions respectively, would be rendered nugatory. However, the Presiding Officer considered that this was a step too far: the Scottish Parliament will be fully subject to the limitation set out in section 29 until Exit Day. The Attorney General and Advocate General for Scotland completely agreed with this view and accordingly utilised their right to petition the Supreme Court for a judgment on the legality of the Scottish Parliament’s Continuity Bill (Referenceon UK Withdrawal from the European Union (Legal Continuity) Bill 2018). Conversely, the Lord Advocate takes the diametrically opposite view, alongside the Attorney General for Northern Ireland and the Counsel General to the Welsh Government. These three legal officers consider that the Bill was squarely within the competence of the Scottish Parliament, notwithstanding the reservations expressed by the Parliament’s Presiding Officer. The Supreme Court, in a seven judge configuration, including of course the two Scottish justices (Lord Reed and Lord Hodge) heard the case on the 24th and 25th of July 2018 and delivered its judgmenton the 13th of December 2018. The challenge is without precedent: it is the first time, in the two decades of operation of the Scottish Parliament that both the Presiding Officer has questioned the competence of a Bill passed by the Scottish Parliament and the UK Legal Officers have exercised their legal right to send a question on the competence of a Scottish Parliament Bill to the Supreme Court. The novelty of the case has thrown up some interesting legal questions. “in principle Acts of the Scottish Parliament are amenable to the supervisory jurisdiction of the Court of Session at common law”. This judgment is authority for the proposition that Acts of the Scottish Parliament are vulnerable to challenge under the limits to Scottish Parliament law making set out in section 29 of the Scotland Act 1998 and judicial review principles of the common law. However, he then went on to qualify this statement by noting that not all of the generally available judicial review grounds of challenge would be available to challenge the provisions of a public body such as Acts made by the Scottish Parliament since the Scottish Parliament was a democratically elected body with law making and tax raising powers and as such its laws would enjoy the highest legal authority. Thus, challenges to laws of the Scottish Parliament could not ordinarily be taken on grounds of irrationality, unreasonableness or arbitrariness. Indeed, Lord Hope stated that the common law grounds of challenge could only ever be contemplated in extreme circumstances, such as where a law purported to violate the rule of law by closing off judicial review or the courts’ ability to protect an individual’s rights. Although factually and legally correct, and intensely interesting, the Lord Advocate swiftly dispensed with this line of argumentation. These options for review are only appropriate for challenges taken against laws made by the Scottish Parliament. Legislative proposals before the Scottish Parliament can only be challenged in the 4 week window of opportunity according to the exacting terms of section 33 of the Scotland Act 1998. As such, it is argued that the question before the Supreme Court is not a nuanced one akin to cases seeking annulment of laws based on rule of law conceptions such as irrationality and arbitrariness in the exercise of powers stated in that law. Rather, it was submitted by the Lord Advocate that the question was simpler and binary in nature: is the Bill within the legislative competence of the Scottish Parliament, by not encroaching upon matters properly addressed by the UK Parliament or not? If the question is indeed binary as suggested, then the substantive question turns on the notion of international relations and EU law as international law. Again, here the question may not be as complicated as argued by the UK Law Officers. The UK Law Officers argue that the Bill is not within legislative competence since the Bill cuts across fundamental sovereign powers only exercisable by the UK Parliament, namely the exercise of international relations. Succour for this line of argumentation comes from the Miller case, whereby the Supreme Court conformed that the triggering of Article 50 TEU fell squarely within the legal power of the sovereign Parliament of the UK (Miller v S. of S. for Exiting the EU  UKSC 5). However, again here there is possibly a misunderstanding of the scope and nature of the powers purportedly being exercised in the Scottish Parliament’s Bill. Of course, the contested Bill is concerned with EU law and the Scotland Act clearly prohibits the Scottish Parliament from acting in the international plane or to do anything interfering with the sovereign power of the UK Government and UK Parliament to both conduct relations with (and within) the EU institutions and to change UK law, notably the European Communities Act 1972, to comply with changed EU law obligations (such as additional Treaty obligations). However, the Scotland Act is also concerned with a completely separate, internal aspect of EU law: the Scottish Parliament and Government cannot make law or perform executive functions in violation of EU law. This provision is actually designed to protect the UK from the legal consequences of devolved institutions acting, to borrow a delictual and tortious phrase, on a frolic of their own which will impute liability upwards to the UK. This limitation on power set out in section 29 of the Scotland Act 1998 is vital and core to the very essence of the Scottish Parliament’s function: an overwhelming majority of legislative activity in the Scottish Parliament is directed at complying with EU law and giving effect to EU law. At the inception of devolution at the tail end of the last century, the Scottish Parliament and Scottish Government were given power over any areas of competence not reserved to the UK Government and Parliament. Most of these devolved powers were actually powers exercised at the EU level, on a shared basis with the member States – agriculture, fisheries, environmental protection, consumer protection etc. Therefore, the Scottish Parliament was directly tasked with complying with EU law, but this ‘internal’ aspect of EU law in no way impugns the ‘external’ aspect of EU law, exercisable by the UK Government and Parliament. Relatedly, it has already been judicially recognised that the devolution institutions will experience a significant Brexit dividend – an entire swathe of restrictions on the competence of the devolved institutions will be completely expunged on Brexit day (see Miller). This ‘internal’ aspect of EU law directly concerns the Scottish Parliament and it would be nonsensical if the Scottish Parliament could not take measures to clarify the scope of how this fundamental shift in its competences is to operate. The Lord Advocate also dispenses with the argument made by the UK Law Officers concerning the future contingency nature of the provisions of the Bill. The UK Law Officers argue that the terms of the Bill, as drafted would cause the Scottish Parliament to be in breach of its obligation not to undermine EU law as set out in section 29 of the Scotland Act 1998 by simple dint of the fact that the Scottish Parliament must comply with EU law right up to 11pm on the 29th of March 2019. The UK Law Officers set much store on the contingent nature of the power given by the Bill to the Scottish Ministers to bring into force such provisions once the Bill became law. This argument appears weak. Commencement orders are a perfectly natural feature of the UK legal landscape, both devolved and reserved. It is perfectly normal and legal for a legislature to anticipate future changes and to legislate accordingly. Further, if the said contingency never materialises, then it is simply the case that that legal power is never exercised and can be replaced or repealed. A further objection to the proposed Bill was taken by the UK Law Officers to the effect that the Bill could not alter the terms of the Scotland Act 1998 as regards the restriction of legislative competence on the grounds of EU law compliance (section 29(2)(d) SA 1998). The Lord Advocate tersely rejected this argument as well. The system of devolution generally provides that Acts of the Scottish Parliament can be used to modify Acts of the UK Parliament, where that UK law relates to devolved competences. This significant power is a well-established feature of the devolved landscape. Nevertheless, legally and practically there has to be limitations upon this power, otherwise the devolved Parliament would, at a stroke, have been transformed into an omnipotent, fully sovereign Parliament: An anathema to the very nature of devolution. Thus, the Scotland Act 1998 does generally provide that an Act of the Scottish Parliament cannot be used to modify certain central tenets of the constitutional devolution framework as provided for in the Scotland Act 1998. To put it more simply, the Scottish Parliament cannot pass an Act of Parliament giving itself more power. However, the Scotland Act 1998 does allow for some modifications to take place (Schedule 4 SA 1998). For present purposes, para. 7 of Schedule 4 of the Act is central. This part of the 1998 Act provides that an Act of the Scottish Parliament can be passed to take out ‘spent’ provisions. The key argument facing the Supreme Court is the notion of when the references to the EU limitations on the legislative competence of the Scottish Parliament become spent. If the UK Law Officers are right, the Scottish Parliament cannot act to expunge the references to EU law limitations on Scottish Parliament competence until the UK leaves. Form the Lord Advocate’s perspective this view is unduly restrictive. 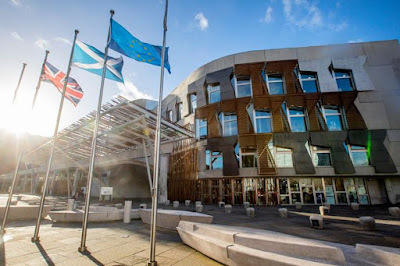 It binds the hands of the Scottish Parliament until Brexit Day and, given the inherent uncertainty over the exact legal implications of the UK’s departure from the UK on the 29th of March 2019, the Scottish Parliament cannot act prospectively to arrange its affairs as regards Scots law (the devolved statute book) to manage and ensure an orderly, legally certain departure. The final aspect of the case which is intriguing is brought about by the mere effluxion of time. At the time of passing the Bill in the Scottish Parliament, the UK Parliament had yet to pass its own legislative proposal for an orderly Brexit. But soon after the legal objection was made to the Scottish Bill, the UK Parliament’s EU (Withdrawal) Bill received Royal Assent. This law provides for retained EU law to be created for the utility of the entire UK. However, of course, the Scottish Parliament objected to the terms of that law, refused a Legislative Consent Motion and proceeded to continue to attempt to enact its own continuity law. A direct consequence of that fact was that the Scotland Act 1998 was then amended to add the terms of the EU (Withdrawal) Act 2018 into the list of laws in Schedule 4 that are unamendable by the Scottish Parliament. Thus, the practical result is that if the Scottish Parliament were to now try and introduce a Bill along the lines of the impugned Continuity Bill, that Bill would be clearly outwith the legislative competence of the Scottish Parliament. Thus, the Lord Advocate has craved that the Supreme Court consider the question of legislative competence as of the date of passing the Bill and not at a later date in time. If the Supreme Court were to look at the case as from a later date in time, then the reference has been of purely academic interest. However, even if the Supreme Court looks back in time to the point of passing the Bill, the answer also becomes academic since the unamended Bill, from a practical point of view cannot be passed since it has been rendered otiose. The best the Lord Advocate can hope for now is that the Bill is characterised as being in legislative competence and that certain, now unlawful provisions of the Bill, can be expunged from it, allowing the legislative proposal (as amended) to be turned into an Act of the Scottish Parliament. This morning’s judgment is a clear vindication of the Lord Advocate’s position. The court was unanimous that, at the point in time when the Bill was passed in the Scottish Parliament, the entire Bill was within the legislative competence of the Scottish Parliament, with the sole exception of section 17 of the Bill. However, time marched onwards such that, at the time of this judgment, some of the legal space about to be occupied by the Scottish Bill was now occupied by the law of the sovereign Parliament of the United Kingdom. As such, the court therefore qualified its decision and recognised the clear legal reality pertaining at the date of the judgment – certain provisions of the Bill were now rendered otiose and legally impermissible as a direct result of the coming into force of the terms of the UK Parliament’s EU (Withdrawal) Act 2018. Thus, it is in part a pyrrhic victory for the Lord Advocate. The Bill, as presented at the time of progressing to Royal Assent was completely within the legislative competence of the Scottish Parliament. However, large sections of the Bill now fall away since they are in direct conflict with the terms of the 2018 Act and are thus outwith legislative competence of the Scottish Parliament. In these uncertain times, it is absolutely certain that there will now be interesting conversations regularly taking place between HM Government and the Scottish Government to resolve this legal conflict.